A screw oil press is a machine used to press various types of seeds including cottonseed, grainy oil plant seeds, sesame, and sunflower as well as corn germ for their oil. Most of these raw materials produce high quality edible oil. This machine can be either manual or automatic. The machine is made up of a feeder, a gearbox, a pressing chamber and an oil receiver. Automatic machines have electric motors. A pressing chamber is the major part of the machine because this is where the pressing of the seeds happens. It houses the pressing cage and a screw shaft that rotates in order to squeeze the raw material for its oil. When you are looking to buy a screw oil press, find a machine made of high quality material like steel because it is wear resistant and easy to clean. Also, it is important to find a machine whose pressing chamber has been properly designed to increase the pressure inside. This will ensure improved oil extraction efficiency. The machine should also be able to handle a wide range of applications. 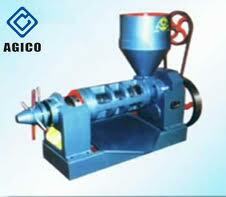 It should be ideal for pressing various kinds of seeds like peanut, sesame, soybean and flax seed. A good oil press machine should have high oil yields and the oil left in the cake should be as little as possible. It is also important to buy a machine that occupies less space. These qualities will ensure you need a low investment for your business. If you are buying an automatic oil press, make sure it is equipped with a device to automatically control the temperature and the filtering of oil. The advantages of an automatic screw oil press over a manual one is that it is more efficient and saves on labor costs. This entry was posted in Screw Oil Press. Bookmark the permalink.